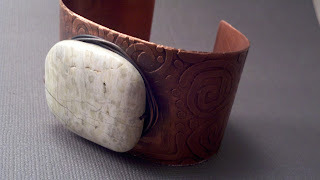 One of a Kind Jewelry for One of a Kind You: Bead Table Wednesday~Recycling~and the most comfortable bracelet ever!!! 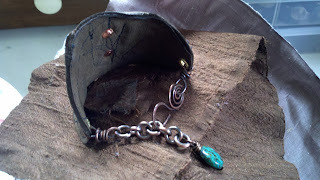 Bead Table Wednesday~Recycling~and the most comfortable bracelet ever!!! 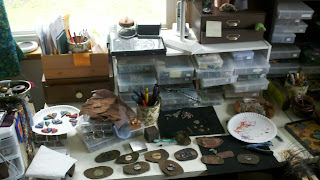 Here is my bead table on this wednesday! Oh, what happend you ask? You see, I was reading a blog, and found myself linking to another, and saw a cool tutorial for leather cuff bracelets, and so I decided that it was a good idea to recycle my FAVORITE, yet old and outdated, bombers jacket from high school. I didn't want a full cuff, even though that is what they were making. They were neat, and, if I could remember where I saw the tutorial, I'd link it for you (sorry). But I have been trying to make cuff bracelets in copper with a focal bead, and I am finding that I don't think they are comfortable enough to wear. Now- that may just be me, I am not a huge bracelet kinda gal. But I think I have found the perfect combonation of comfort and style. I haven't taken this off for days. 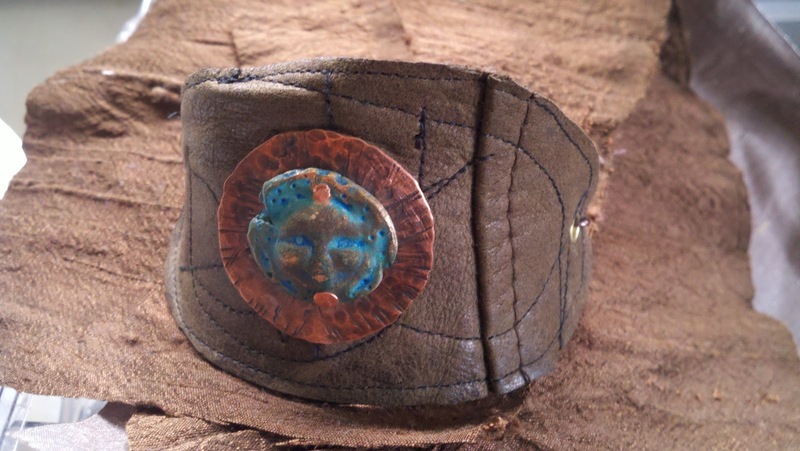 Here is my version of the leather cuff bracelet, but instead of a cool button to fasten it, I used a focal on front, and a chain and hook clasp to make it adjustable. 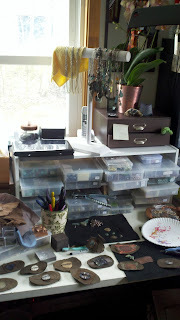 So my bead table today is covered with a batch of them. My hands are black and cut up from the copper and filing and riveting.....there are little pieces of thread and leather ALL over my studio floor, and I am NOT doing anything on my list. But I am happy. So, I guess thats all that matters. 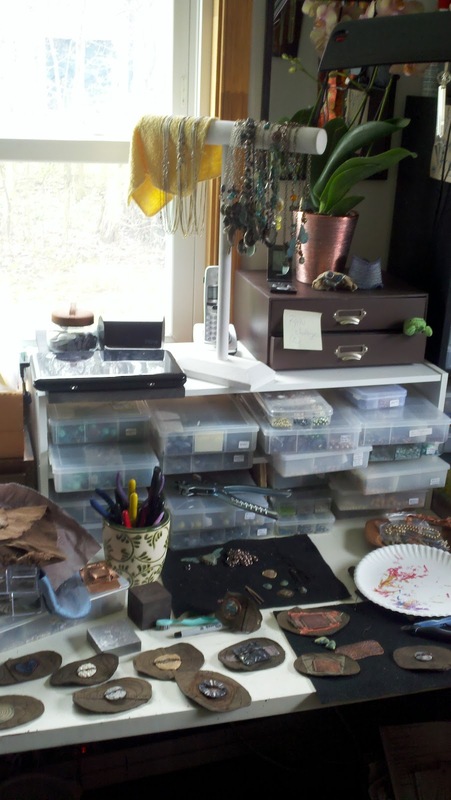 Whats on your bead table? These are wonderful! I've never seen cuffs quite like this, but I think they are more attractive than others I've seen. Your table looks great! Gorgeous cuff!! It looks comfy and soft! I love it! You're so good at those bracelets!